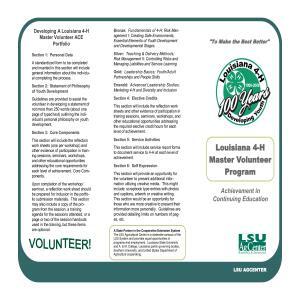 The Louisiana 4-H Master Volunteer Achievement in Continuing Education (ACE) program is designed in four levels to assist volunteers in the development of specialized skills as 4-H volunteers by participating in quality training experiences, processing learning experiences, conducting service activities/projects, and developing a Master Volunteer ACE portfolio. 4. 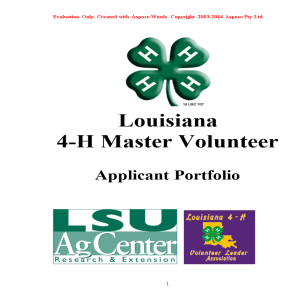 Develop an infrastructure to expand the reach of 4-H Youth Development in Louisiana. Candidates must have at least one year of 4-H volunteer experience as of December 1 of the current year and must be at least 18 years of age. Recognition for achievement will be presented at the annual 4-H Volunteer Leaders’ Conference. Workshops/service activities included in portfolio must have been completed within five calendar years of the date submitted. Each component of the portfolio must be completed and submitted as one document by the January and/or July records due date. The portfolio will be re-submitted as each level is added to the original. It will be returned at the annual volunteer leader conference. Only one level of achievement may be attained in a given year. Participation in state level master volunteer training weekends is not required but may be helpful in getting established with the program. Those attending state master volunteer training conference will receive a large, three-ring binder for their materials. Those not attending that training meeting will be responsible for providing their own binder for their portfolios. Printed materials will be available online or may be obtained from a local Extension office or the State 4-H Office upon request.